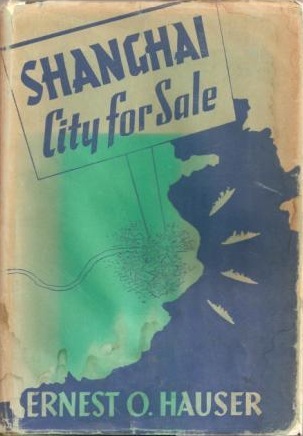 Shanghai, City for Sale. By Ernest O. Hauser. (The Chinese-American Publishing Company, Shanghai). Pp. 323. 1940. This best-seller, which was published at least a year ago in the West, has now appeared in the Far East by special arrangement between the more expensive printers of New York and a Shanghai company. For the sake of our pocket-books and our consciences we should be grateful; it is nice to be able to pay a civilized price for a book without sneaking into one of the pirate shops much as we used to enter into a speakeasy, and suffering from a feeling of guilt and betrayal. Our eyes, however, still have reason to complain. The printing of Shanghai, City For Sale is not all it should be. Once more must we undergo a strange sensation of vertigo as the lines sway and stagger across the page, and here and there a dropped letter or a smudged one interferes sadly with the narrative. Still, it is something to avoid that conscience-pang which I, for one, always experience when I buy and read a Shanghai-published book without a printer’s mark. John Gunther in his Inside Europe did a lot to bridge the gap which used to exist between the daily newspapers and the more dignified medium of book-print. Other newspapermen had written popular books; a flood of them followed Vincent Sheehan’s Personal History, but until Gunther started the fashion of remaining true to his own style these journalists seemed to recognize and observe the rule of difference. Each of them obviously welcomed the home-made opportunity of going a little highbrow when they sat down to address the public from between board covers instead of decorating the naked columns of the press with hasty statements of fact or theory. Most newspapermen, like Hollywood writers, considered themselves martyrs and hacks, disappointed artists in fact. Gunther was more cheerful and arrogant about his career, and he had reason to be; he became a recognized authority on international affairs while he was still at an age when most journalists are cubs. No doubt this self-confidence was in part responsible for the quick-moving style of his Inside books; he translated the manner of his Sunday articles to Inside Europe and Inside Asia without the slightest effort, and the result was an outstanding success. (I have been informed that Mrs. Gunther has recently published a work called Inside Gunther). This is not a review of one of John Gunther’s books, but because Inside Asia made its appearance at about the same time as Mr. Hauser’s, I observed a phenomenon in respect to both which I should like to discuss. Both books are about the Far East and because of this are eagerly read by Europeans who live in this part of the world. Indeed, Gunther’s book was pirated almost before it made its appearance in the legitimate book-shop—aye, and the pirated edition was bought by me, among others. It was natural that we should be interested. The phenomenon I have mentioned is to be seen in the belligerent manner we China Hands assume when we read a book about our own part of the world. Inside Asia was greeted with what I can only describe as howls of rage, and every inaccuracy was pounced upon. The pounce is natural—we all welcome a chance to show how much we know at the expense of the other fellow. The noteworthy and unpleasant aspect of the matter is the unholy glee with which we welcome every chance to pounce. I may be wrong, but I think we are more critical out here of the literature that deals with our terrain than any other reading public in the world. It may be that there is something about China, this great peaceful easy-going tolerant place, that works by contraries in the hot blood of foreigners who live here too long. This toxin can even extend its deadly effects over the sea. Who can be more bloodthirsty than a Sinologue, particularly one who has never been to China? Duels have been fought, feuds instituted, savant reputations lost, suicides committed over small details. The only people who remain unmoved in these quarrels are the Chinese themselves. As a matter of fact, I don’t know. I don’t know anything about Mr. Hauser, except that if he picked up everything he includes in Shanghai, City For Sale in a couple of weeks he has done a remarkable job and must be excused many mistakes. But I think he must have been there a couple of months at least. He would have needed that long to have indulged in the long, leisurely, gossippy talks which one can read between the lines. Mr. Hauser has obviously taken much of his information from several specimens of our own class, the China Hand. Some of the less credible legends which I will discuss are hardy perennials from the Shanghai Club and others bear witness to Central Road influence. Still others I have heard in the offices of the North-China Daily News. Hauser seems to have investigated the British versions of these stories rather than the American; he has carefully studied the habits of the “taipans” though he leans the other way in his sentiments. He favours the oppressed factory-worker and the disgruntled Chinese tax-payer though he is willing to share Central Road’s dislike of the Soongs with those same compradores, foreign and Chinese, he so much scorns. He is fully aware, almost too insistently, of the romance of Shanghai. The bare skeleton of its short, vivid history he has clothed in warm enthusiastic words. From June 11th, 1842, when the Nemesis brought the conquering British to Woosung, through the arrival of the first British Consul and the beginnings of such houses as Jardine, Matheson & Co., the story has a fascination which never fails for those of us who like to feel ourselves a part of this march of events. To me for one his enthusiasm is annoying; I prefer to point the moral and adorn the tale for myself when such a tale is being told, but then I am a competitor, unlike the majority of readers, and anyway I should not grudge him his pleasure. It is a thrilling story and Mr. Hauser has boiled it down in admirable proportion. One of the best points of his manner is that he has marshalled a number of pleasant, intimate little anecdotes of the “taipans” and put them down in black and white instead of allowing the to be lost when their narrators die out, or retire home on their pensions. He has caught to a remarkable degree the very atmosphere of one of those long sessions with the Old Boys at the Race Club, remarkable because he scorns and mocks those same Old Boys throughout his book. ”Now, with the Generalissimo lying low outside the International Settlement, ready to charge, the time had come for T. V. to smooth things out. He arrived in the very nick of time. He had financed this expedition, had laid the solid foundation for the victories, and he had followed behind Chiang, reorganising the financial systems of captured provinces. In Shanghai, his task was not so easy as this. He went into conference with the Generalissimo, argued with him, brought him to his senses. “He convinced his impetuous friend that he had already won the final battle, that his victory was decisive—if he was wise enough to turn the situation in his favour. Taking the Settlement? He could have it for the asking. He could have China for the asking, if he would only listen. And T. V., with the professional deftness of a compradore, developed his scheme. Anyone who has any idea at all of what really happened at that time knows that T. V. went through a soul-struggle as to the side on which he should fight, and not only did this indecision incapacitate him as a warrior for a long time, but it nearly landed him with the Reds. Some banker, an ardent admirer of T. V.’s works, must have exaggerated his good offices on the conservative side and handed the story on to Mr. Hauser—or it might equally well have been a disgruntled Communist who is not satisfied with the facts with which he castigates the Soongs, and so makes up a few more. Whichever of my hypotheses is correct, one thing is clear; somebody has been over-simplifying into Mr. Hauser’s credulous ear. Or perhaps he suffers from the curse of all writers who wish to produce vivid stuff, and he does the over-simplifying for himself. As a writer I know the temptation. Truth may be stranger than fiction, but beyond a certain degree of strangeness a story does not tell as well as it would if we could edit it a little. As story-tellers we want to make ourselves readable, and so unless we watch ourselves carefully we edit a little bit beyond the bounds of what is permissible. Who does not know the bore who includes unnecessary details in his anecdotes? We dread being like that bore—but when we dread him too much we must stop calling ourselves historians and go back to our proper field, which is imaginative fiction. Mr. Hauser could write an admirable series of stories for the Saturday Evening Post, in which I recently read of a Manchu woman whose bound feet left oddly-shaped marks in the deep pile of the carpet, and a Cantonese girl wore in the streets of to-day’s San Francisco a costume which was old-fashioned in the Ching Dynasty. These mistakes do not really matter to the reading public of the Saturday Evening Post but they would matter in an accredited study of Chinese customs, and Mr. Hauser’s book is supposedly a true accredited account of Shanghai’s history. On almost all the occasions where he speaks of the Soongs he shows the effect of too much listening in Shanghai’s bars and clubs. Madame Chiang is called “the first great female compradore”. Madame Kung is quoted as saying, in reference to the Chiangs’ marriage, “We Soongs can make much of this man”—who, after all, by the time he married Mayling had already managed to make quite a bit of himself. On the other hand, Hauser’s picture of the Shanghai gentlemen sitting comfortably on the Bund as the end drew near, listening uneasily to rumbles from China’s interior and being taken completely by surprise when their ally, Japan, acted up is a good one, and a good running gag through the book. The end came, says Mr. Hauser, when China’s puzzled and inexperienced airmen dropped bombs into the International Settlement.